Jake Tapper Roasts Giuliani On Trump's Taxes [VIDEO] - Joe.My.God. Sunday morning’s political chat circuit saw the beginning of fallout from the New York Times‘ bombshell report on a leaked tax document that shows Republican presidential nominee Donald Trump may not have paid any federal income tax over a period of as much as 18 years. On CNN’s State of the Union, Trump campaign surrogate Rudy Giuliani took a most unpleasant turn on the roasting spit, as anchor Jake Tapper pressed him on his every talking point, and eventually just openly mocked him. 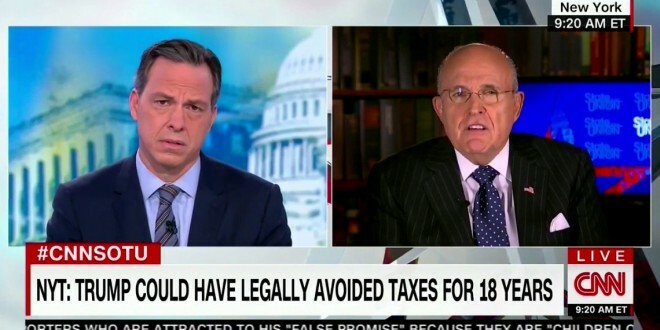 Giuliani began by contending that Trump is a “genius” for paying no federal income tax for at least two years that we know of, which prompted Taper to ask if paying taxes makes the rest of Americans stupid, but things really took a wrong turn when Giuliani refused to tell a visible stunned Tapper whether or not he, personally, pays any income tax, then repeatedly asserted that Trump could be sued by his business partners if he failed to take advantage of personal income tax provisions.